No matter the pace, you want a sock that will match you mile for mile. 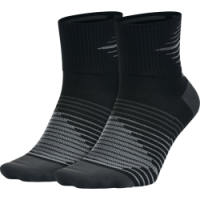 Unisex Nike Dri-FIT Lightweight Quarter Running Sock (2 Pair) has a streamlined design that doesn't sacrifice comfort. Multiple ventilation zones help keep your foot cool and dry, so you can go the distance. Compression creates a snug fit. Color blocking highlights cushioning and ventilation. 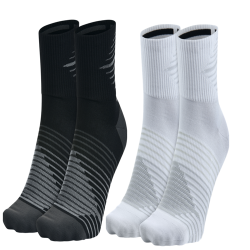 Anatomically correct left and right socks create a natural fit. 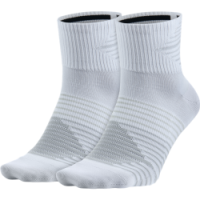 Areas at the top of the foot are knit to create a lightweight feel that enhances breathability. I recently purchased this product and after a single use my feet feel a lot better than previously. It’s highly recommended. The whole buying experience was hassle free. Product ok. Bought 2 packs - all came in white and was expecting a mixed pack. great socks, just that the shipping costs are making it cost prohibitive.